Hilton Head, South Carolina's best local chiropractor near you has been serving the community for more than 40 years. During that time Arrowhead Clinic has built lasting relationships with patients. The Hilton Head community trusts our name and experience to treat neck pain, back pain, whiplash injuries, and other types of accident injuries caused by a negligent person. If you are suffering, or have been hurt in a Motor Vehicle Accident recently, give Arrowhead Clinic a call as soon as possible to schedule your Free Consultation with the Chiropractor. Should I See A Chiropractor After an Auto Accident Injury? If you were involved in a Car Accident in Hilton Head, South Carolina symptoms such as; headaches, numbness, dizziness, stiffness, memory loss, neck pain, and lower back pain can cause you pain for months or even years after the wreck. If you don't seek treatment from an experienced accident injury clinic in your area, your pain will begin to worsen because your injuries are not healing properly. Do not risk your health and quality of life because you chose not to see a doctor after your accident. If another person was at fault, our doctors will work with you and even provide an attorney referral to ensure that all of your medical bills and treatments are paid for. That's why finding an experienced Chiropractor in the Hilton Head, SC area with a history of working with auto accident victims is so important. In fact, many people agree that Chiropractic Treatment after a car crash injury will produce the most accelerated and longest lasting results. Chiropractic Care at Arrowhead Clinic's Hilton Head, SC office is a great choice for victims of motor vehicle accidents. Our unique approach to wellness is always, safe and all natural. This is why many of our patients are even referred by their primary care physicians. Our goal is to help you restore your body's natural mobility while alleviating any soreness and stiffness. Our patients will often see drastic results, including a reduction in their pain symptoms, increased range of motion in their Neck and Lower Back, elevated mental clarity and even a better sleep during the night. We achieve these great results without the use of harmful muscle relaxers and potent narcotics. Instead, we use proven methods like spinal decompression therapy. This uses intermittent spinal traction in order to take stress off vertebral joints while also hydrating the discs. Chiropractic Adjustments work to properly facilitate motion in the joints, and electrical stimulation is used to reduce muscle and nerve pain in localized areas. Arrowhead Chiropractic Clinic is specially designed to treat Car Accident victims, and we are ready to serve you today, CALL NOW! 800-961-PAIN (7246). What Can You Expect During Your First Visit to Our Office? 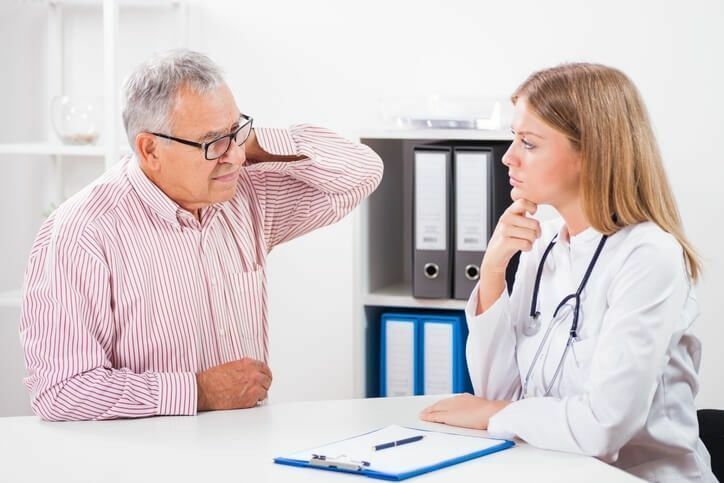 When you arrive for your Free Chiropractic Consultation, you will need to complete some forms that provide background information about your current condition, your accident, your pain symptoms, and your medical history. Was the pain caused by an accident injury? Is the pain non-stop or does it come in waves? Once your chiropractor knows about your medical history, your doctor will conduct a thorough exam. This will include testing like; pulse, blood pressure, reflexes, and respiration. Many injuries that chiropractors treat are soft-tissue or musculoskeletal injuries. This means, that they typically are not visible to the naked eye. These types of injuries and even head injuries aren't always revealed on X-Rays in an Emergency Room Diagnosis. Therefore, seeking professional accident injury care after a car wreck is essential to your overall health and recovery. An experienced car accident chiropractor will ensure a full and fast recovery after suffering an auto-collision. While most individuals will be aware of the injuries they suffered after a wreck, some pain symptoms will be masked by the release of adrenaline and other hormones. This is your body's coping mechanism after a trauma. Therefore, the Chiropractors at Arrowhead Clinics will fully evaluate your spine and identify any "hidden" injuries, then develop a treatment tailored to your specific injuries. The most common delayed pain and injuries that our chiropractors see in patients recently involved in automotive crashes are soft tissue injuries. Although, "whiplash" is the most common soft tissue neck injury by far. Whiplash is commonly described as neck pain but can affect the extremities and other areas down the spine. Being involved in a car crash will put pressure on delicate nerves and can diminish nerve flow to vital organs and limbs. Based on the results of your chiropractic exam and previous medical history, diagnostic studies are helpful in characteristic structural abnormalities to more accurately diagnose your condition and provide compelling evidence to the insurance company why and where you need Chiropractic treatment after an Auto Accident. The most common diagnostic studies ordered during your chiropractic exam include x-rays and MRI's. Injury symptoms caused by accidents can diminish your quality of life making everyday tasks challenging and painful. Therefore, treatment by a chiropractor can quickly relieve your pain and tension, allowing you to return to a healthy lifestyle. All treatments provided by Arrowhead's experienced chiropractic doctors are natural and safe. These are highly preferred by injury victims over risky surgeries and potentially addicting medications that temporarily mask the pain but do not eradicate it. Most trained chiropractors use adjustments known as spinal manipulations to correct the structural alignment of the spine to improve function. Flexion-distraction technique- This technique is a gentle, hands-on spinal manipulation tactic that involves a gentle pumping action on the intervertebral disc instead of direct force. Instrument-assisted manipulation- This manipulation utilizes a handheld instrument to allow the chiropractor to apply a gentle force without thrusting into the spine. Specific spinal manipulation- This manipulation uses a gentle thrusting technique to restore movement within the joint. In addition to reducing your pain, chiropractic care will also boost your immune system, increase your energy, erase diseases at the source, promote your health, increase your fitness level, and even add years onto your life. Short-term goals include reducing pain, restoring muscle balance, and restoring normal joint function. Long-term goals are providing functional independence and regaining tolerance to daily activities and living. What is that Popping Sound You Hear During a Chiropractic Adjustment? Adjusting a spinal joint could (but not always) result in the release of gas bubbles between joints. This is called a cavitation, which results in a popping noise. Just like the sound you hear when you “crack” your knuckles. This sound is completely natural and is caused by the decrease in pressure in the joint, as the joint fluid is released. It is completely harmless and typically very relieving. The muscle re-balancing, postural correction and pain management protocols we use at our Hilton Head, SC Chiropractic office are positively changing the way people recover after a Motor Vehicle Wreck, or other types of personal injury accidents. Our Accident Injury Clinic is the best near you in Hilton Head, South Carolina. Call now for your Free Consultation with the Chiropractor. Wonderful chiropractor. Took my daughters case on a Friday night and saw her early Saturday morning. His patience and attention gave her relief that same day from years of numbness, pain, swelling, and tingling....I only wish we lived closer so I could see him more often.